1813 to Present. 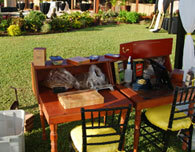 The History of Tobacco in Hawaii to Modern Day Production by the Kauai Cigar Company. Endless Summer Cigar Festival – Hawaiian cigar retailers and island’s sole cigar maker host a festival combining bushiness and pleasure. Les Drent of the Kauai Cigar Co. is making sure that Hawaii is known for more than just beaches, sunshine and leis. Hawaii’s only Cigar maker and grower is joining forces with Martin and MacArthur on Saturday for the first public cigar rolling seminar. “This tobacco here is even more beautiful than the tobacco you see from Cuba,” he says. “Gorgeous!” He’s not just blowing smoke: The ligero—the leaves from the top of the plant used for a cigar’s filler, which are usually the smallest — are the size of turkey platters. Like fine wine, coffee and cigars are meant to be savored — their aroma as important to the sensory experience as their flavor. That’s one of the things visitors will learn on a tour of Blair Estate, which cultivates three acres of coffee and two acres of tobacco in the lush hills of Kapaa, Kauai. That’s why the world now has premium cigars made from tobacco grown on Kaua‘i, where soon the stogies will be rolled as well. Visitors can see the entire process on the farm tours—also one-of-a-kind—that Drent plans to launch this April. This island business produces cigars that are comparable to the ones made by the top brands of Central America and the Caribbean, and it does so by using a blend of filler tobacco that includes leaves grown on its farm on Kauai, a mountainous island with nutrient-rich volcanic soil and ample rain.